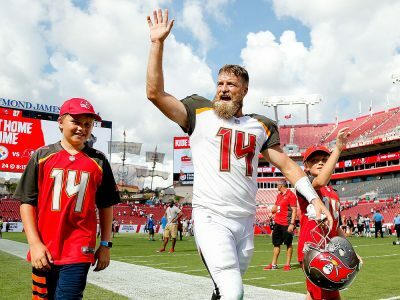 Tates faith in his fathers ability to play some good football was not displaced last sunday when Ryan Fitzpatrick had the staduim going crazy. Prior to week 1, Ryan Fitzpatrick was ranked 997th overall player rank. After week 1 he is ranked first overall. Tampa Bay Buccaneers quarterback Jameis Winston is currently suspended from the NFL because he violated the NFL’s personal conduct policy, leaving the Bucs to start the 35 year old Ryan Fitzpatrick. He has been in the league since 2005 and has never been to a super bowl, he has never won league MVP, and he has never even been to the pro bowl. But on Sunday he had an amazing performance. Throwing for 417 yards and 4 touchdowns there was no stopping him. On top of that he ran one in for six, earning him the nick name “Ryan Fitz-Magic”. Will this mean that he will start over Jameis Winston when he is realived of his suspension? Possibly. Jamies Winstion isn’t anything special but Ryan is still going to have to prove to the fans that he can consistenlty deliver at this high level. He only has 3 games. That might be all he needs. Not really sure what I'm doing.